Widely distributed from southern Alaska to Southern California, New Mexico and Arizona, missing the coast ranges of Oregon and California. This species is highly variable. Found in moist and dry places at middle elevations in the mountains. Fairly common in both the Cascades and the Olympic Mountains. Prefers meadows and slopes at medium and lower elevations in the mountains. Found in open woods and meadows (both dry and moist) thickets, grassy slopes, clearings, roadsides. Is reported to be somewhat parasitic and requires a host plant. Although this plant requires a host species, it does not seem to be particularly associated with any one host plant. Composites, grasses and legumes are the most common. C. miniata flowers from May to September. Allow seed pods to dry on the plant before collecting. Plants may also be divided, but be aware that they may be parasitic to roots of other plants. If collecting seeds or plants in national parks or forest, please refer to their guidelines for gathering and removing plant materials. Cold stratification for 3 months or direct sow outside in the fall. If starting indoors, stratify first. There are conflicting reports of the viability of using divisions of the rootball for propagative purposes due to the plant’s parasitic nature. Most sources recommend sowing seeds for C. miniata because of this. Transplanting is not recommended. Requires open, quick-draining, but moisture retentive and deep soils of moderate fertility. Prefers a neutral Ph. Seeds have a high rate of germination, and therefore cost should be reasonable, especially if collecting the seeds yourself. It is recommended that you sow seeds amongst other plants so that a relationship can be established with the host plant. Heavy fertilizing is highly recommended in the establishment phase. Water normally. Keep the host plants maintained so that they do not overtake C. miniata while it is trying to establish. Clark, Lewis J. Wild Flowers of the Pacific Northwest from Alaska to Northern California. Vancouver, BC: Evergreen Publishing Limited, 1976. Dave’s Garden, Plant Files. 26 April 2006. < http://davesgarden.com/pf/go/1009/index.html>. Foster, H. Lincoln. Rock Gardening. A guide to Growing Alpines and Other Wildflowers in the American Garden. New York: Bonanza Books, 1968. Glicenstein, Leon. Some Native Orchids of Northeastern USA. 26 April 2006. <http://www.hoosierorchid.com/article_snoneusa.pdf >. Hitchcock, C. Leo and Arthur Cronquist. Flora of the Pacific Northwest: An illustrated Manual. Seattle: University of Washington Press, 1973. Hitchcock, Cronquist, Ownbey and Thompson. Vascular Plants of the Pacific Northwest. Parts 1-5. Seattle, Wa: University of Washington Press, 1961. Lawrence, Beth. 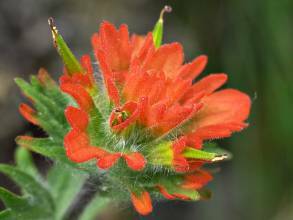 Studies to Facilitate Reintroduction of Golden Paintbrush (Castilleja. Thesis. Oregon State University, December 2005. 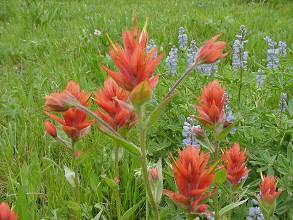 10 May 2006 <http://www.appliedeco.org/Reports/ LawrenceThesis/Lawrence_Thesis_CHAPTER%205%20Growing%20Castilleja.pdf>.